Gentile Bellini (c. 1429 – 23 February 1507) was an Italian painter of the school of Venice. He came from Venice's leading family of painters, and at least in the early part of his career was more highly regarded than his younger brother Giovanni Bellini, the reverse of the case today. From 1474 he was the official portrait artist for the Doges of Venice, and as well as his portraits he painted a number of very large subjects with multitudes of figures, especially for the Scuole Grandi of Venice, wealthy confraternities that were very important in Venetian patrician social life. 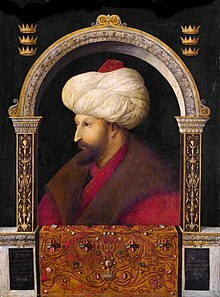 In 1479 he was sent to Constantinople by the Venetian government when the Ottoman Sultan Mehmed II requested an artist; he returned the next year. Thereafter a number of his subjects were set in the East, and he is one of the founders of the Orientalist tradition in Western painting. His portrait of the Sultan was also copied in paintings and prints and became known all over Europe. Sultan Mehmed II, 1480; oil on canvas; National Gallery, London. Gentile was born into the leading family of painters in Venice. His father Jacopo Bellini, was a Venetian pioneer in the use of oil paint as an artistic medium; his brother was Giovanni Bellini, and his brother-in-law Andrea Mantegna. He was christened Gentile after Jacopo's master, Gentile da Fabriano. Gentile was taught painting in the workshop of his father. Although today Gentile is often seen in the shadow of his more famous family members, in his own time he was considered among the greatest living painters in Venice and had no shortage of commissions; his talent as a portraitist revealed itself at an early age. Doge Giovanni Mocenigo, c. 1478; Tempera on panel; Museo Correr, Venice. Procession of the True Cross in Piazza San Marco, 1496; Tempera & oil on canvas; Accademia, Venice. Gentile's earliest signed work is The Blessed Lorenzo Giustinian (1445), one of the oldest surviving oil paintings in Venice (now at the Accademia Museum). During the 1450s Bellini worked on a commission for the Scuola Grande di San Marco and painted in conjunction with his brother, Giovanni Bellini. From 1454 he was also the official portrait artist for the Doges of Venice, (for example, see image of the Doge Giovanni Mocenigo at right). Much of Gentile Bellini’s surviving work consists of very large paintings for public buildings, including those for the Scuola Grande di San Giovanni Evangelista. Along with Lazzaro Bastiani, Vittore Carpaccio, Giovanni Mansueti and Benedetto Rusconi, Bellini was one of the artists of hired to paint the 10-painting narrative cycle known as The Miracles of the Relic of the Cross. The commission was intended to celebrate the relic of the Holy Cross which the confraternity had received in 1369. Gentile's contributions include the Procession of the True Cross in Piazza San Marco, which dates from 1496, and the Miracle of the True Cross at the S. Lorenzo Bridge, dating from 1500 and featuring Gentile's self-portrait and that of his brother Giovanni. Venice was, at that time, a very important point in which cultures and trade bordered on the eastern Mediterranean Sea and provided gateways to Asia and Africa. As noted, in his lifetime, Gentile was the most prestigious painter in Venice. Therefore, in 1479, he was chosen by the government of Venice to work for Sultan Mehmed II in Constantinople. However, in addition to his work at the Ottoman Court, Gentile's work also responded to other aspects of the East, including the Byzantine Empire. Gentile Bellini's Madonna and Child Enthroned, late 15th century. Note the Islamic prayer rug at the feet of the Virgin Mary, an example of Oriental carpets in Renaissance painting. In September 1479 Gentile was sent by the Venetian Senate to the new Ottoman capital Istanbul as part of the peace settlement between Venice and the Turks. His role was not only as a visiting painter in an exotic locale, but also as a cultural ambassador for Venice. This was important to Mehmed II, as he was particularly interested in the art and culture of Italy, and he attempted on several occasions to have himself portrayed by Italian artists. He finally reached his goal with Gentile, who is believed to have painted the portrait of Mehmed II now in the National Gallery, London, (but largely overpainted). It has been noticed that the portrait is like one of the figures in a painting by Marco Palmezzano, Jesus among the Doctors in the Temple (Brisighella, near Forlì and Ravenna). So the dating and authorship of the portrait by Bellini have been placed in question. Subsequently, an Oriental flavour appears in several of his paintings, including the portrait of a Turkish artist and St. Mark Preaching at Alexandria (above). The last was completed by his brother, Giovanni Bellini. Bellini made a painting of the head of John the Baptist on a charger, the saint being revered by the Turks as a prophet. When the picture was brought before the Sultan, he praised the skill exhibited there, but drew Gentile’s attention nonetheless to an error, which was that the neck stretched out too far from the head, and as it appeared to him that Gentile appeared unconvinced, to enable him to see the natural effect, he had a slave brought to him and had his head chopped off, demonstrating to him how, once separated from the chest, the neck contracted. Gentile, fearful at such barbarities, immediately tried in every way to be released from his contract in case one day he himself should be the victim of such a joke. This anecdote is likely apocryphal, as a similar story had been told by Seneca of Parrhasius, as well as of Michelangelo via a dubious source. Queen Caterina Cornaro, c. 1500; Szépmüvészeti Múzeum, Budapest. Gentile responded to other aspects of the East, including the Byzantine Greek Empire, as well as Venice’s other trading partners in North Africa and Levant. Venice had a long-established relationship with the Eastern Mediterranean. Saint Mark, Venice’s patron, was from the Egyptian city of Alexandria, and Venice’s cultural and spiritual centre – the basilica of San Marco – was built in his honor (and as his mausoleum) in the Greek Byzantine style. Although Constantinople fell to the Ottoman Turks in 1453, the Greek Byzantine world had a continuing impact upon Venetian art and culture as a number of Greek Christians fled Muslim rule. It was here that Gentile painted the portrait of Queen Caterina Cornaro of Cyprus (at right). This is counted as the second known portrait including the queen, which is now in the collection of the Szepmuveszeti Museum in Budapest. Titian could not bear to follow the dry and labored manner of Gentile... Because of this, leaving this awkward Gentile, Titian attached himself to Giovanni Bellini: but his style did not entirely please him either, and he sought out Giorgione. In recent years, Gentile has once again generated interest, especially in a recent spate of scholarly publications and exhibitions on the subject of cross-cultural exchange between Europe and the Levant. Wikimedia Commons has media related to Gentile Bellini. ^ "Italian Culture and History". Boglewood.com. Retrieved 2013-09-17. ^ MSN Encarta : Online Encyclopedia, Dictionary, Atlas, and Homework. Archived from the original on 2009-11-01. ^ a b c "Contemporary Art - Artist Portfolios - Art News". absolutearts.com. Retrieved 2013-09-17. ^ "The Sultan Mehmet II". Nationalgallery.org.uk. Archived from the original on 2007-08-26. Retrieved 2013-09-17. Chisholm, Hugh, ed. (1911). "Bellini" . Encyclopædia Britannica. 3 (11th ed.). Cambridge University Press. ^ Dolce, quoted in Alan Chong, "Gentile Bellini in Istanbul: Myths and Misunderstandings," in Bellini and the East (London: National Gallery Company, 2005), p. 106. ^ See also Venice and the Islamic World (New York: Metropolitan Museum, 2007). ^ A repetition from Bellini's workshop that belonged to William Beckford is in the Frick Collection, New York. Gentile Bellini in "A World History of Art"